Before Lucia opens tonight, I had time to check in with our flute soloist, Scott Goff. Born in Panama City, Goff lived at various military posts until his family settled in Tacoma, Washington, upon his father’s retirement from the United States Army. Goff began playing flute at age twelve and studied with successive principal flutists of the Seattle Symphony. He has been principal flutist with the Seattle Symphony since 1969, and plans to retire at the end of this year. Scott, you’ve been a professional flutist for fifty years. 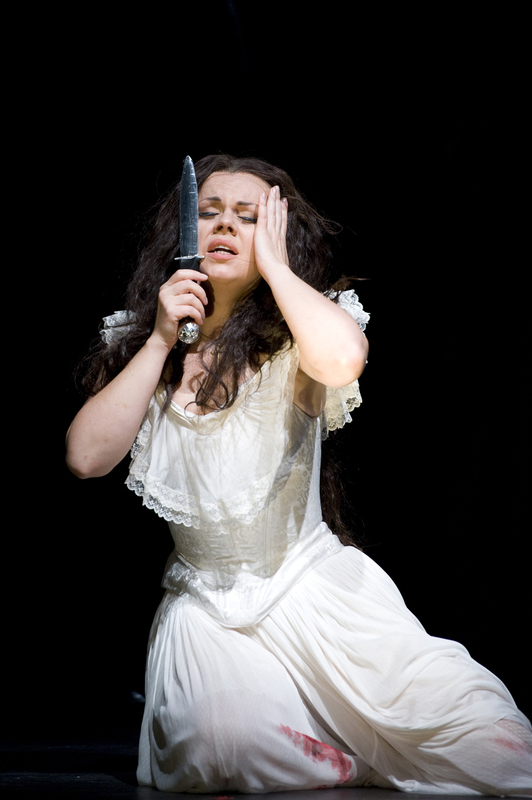 How many productions of Lucia di Lammermoor have you now played? I’ve done this opera five times with Seattle Opera, which is (I think) all of them! I played it for Beverly Sills, who sang the role at Seattle Opera with Milton Katims conducting; and we once did the mad scene in concert, at Seattle Symphony, with Joan Sutherland. Wow, what was that like, playing with Sutherland and with Sills? Sills was perhaps a little closer to my heart, just because she was such a perfect musician. I think her technique was perhaps a little more instrumental. But how could anyone say no to Sutherland’s remarkable voice--its sheer size and quality, and her phenomenal technique, plus her range. Sills didn’t have the huge top that Sutherland had. Sutherland was probably the better voice for Lucia...although Sills sang the best “Marten aller Arten” from Abduction of the Seraglio I’ve ever heard. No one else ever even came close. My wife and I are real opera lovers. We’d much rather go to an opera than to the symphony! I think right now the thing I’m enjoying the most is probably Il trittico; there was a phenomenal production at the Met a few years ago. It’s one of the few operas I never got a chance to play. Puccini is at the top of my list. I also love Verdi, adore Il trovatore, particularly if you have the right kind of tenor. We also love listening to Don Pasquale. Do you listen to Lucia when you’re not playing it? Yes, the Sutherland is one of favorite recordings. Is it difficult to get the flute solo in Lucia in sync with what’s happening onstage? Not as long as the stage director doesn’t throw you a curve. I’m trying to remember which production it was--many years ago, when Lucia started her cadenza, her back was to me and the audience. For some dramatic effect she was way upstage, and it’s hard to do a duet with somebody who’s standing with their back to you, and fifty feet away! Fortunately Speight doesn’t let stage directors do silly things like that. In our current production she’s downstage practically the whole time. That makes it much much easier. Where are you standing when you play the solo? I stand on the podium, right next to the conductor, who helps me. It’s a bit crowded, but it’s necessary that I see her. That’s the way we’ve always done it here, I don’t know what they do elsewhere. That’s how we do the Siegfried horn call, too. Are you reading the music, or do you have it memorized? Yes, I use my music--I have a music stand up, on the podium. Do you need to see the soprano breathing? Yes, I certainly pay attention to when she’s going to take a breath--that triggers me that she’s about to start singing. The soprano varies the color of her sound with a thousand different parameters. How do you achieve a variety of musical color on the flute? You don’t, really. You can vary your vibrato, and of course your dynamics. If you’re asking about musical choices such as slurs, staccato/legato, etc., the phrasing is pretty much set. The way Aleksandra Kurzak, our Lucia tonight, shapes each phrase, she does it the same. She may have more freedom in terms of the staging, that may be different each night, but the musical choices stay the same. Any advice you’d like to give to young flutists who hear the production?